Browsing Privately is an extension that is limited only to Google Chrome browser. It asserts to let users search the web privately. After installation, this program will alter settings on the browser to control homepage and default search engine. Apart from custom search provider, Browsing Privately will include free weather updates and links to popular site right at the homepage. Presence of this unwanted program is very noticeable due to changes on the homepage and search settings (see image below). There are a number of concerns about this extension. Some user claims that Browsing Privately arrives on the computer as part of other adware. In fact, there are no decent feedback on its Chrome Store Reviews (page was removed) despite of having hundreds of registered users. Freeware or shareware that bundles Browsing Privately are merely to blame for its sudden appearance. Thus, suspicious free program must be removed as well. 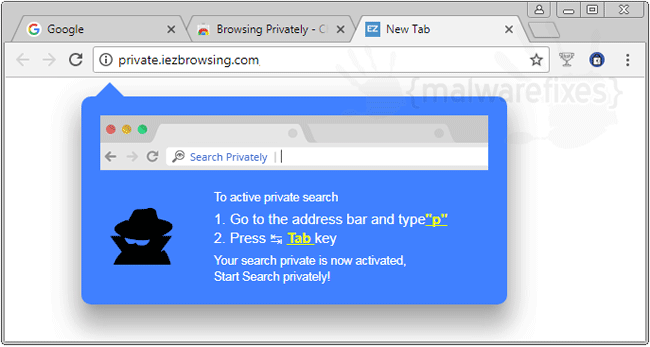 If you need effective guide to remove Browsing Privately, simply browse the section below. We have tools that can scan the computer to find and remove files belonging to this unwanted program. Using our procedure not only allows you to remove the extension, it will also locate and delete malicious program that brought in Browsing Privately. 3. Look for and remove Browsing Privately entry. If not present, look for any suspicious labels that was installed recently. 4. It searches for presence of harmful programs, plug-ins, add-ons, or any data that were found malicious and linked to Browsing Privately. You need to Clean all items detected by this tool. After the previous scans, you may have deleted Browsing Privately from the affected browser. This next step will ensure that no more module of adware will be left on the browser. This free tool scans and checks the browser for unwanted add-on and extension, and if found, Avast Browser Cleanup will give you a report and suggestion. 4. Avast Browser Cleanup will confirm before it permanently deletes the add-on. 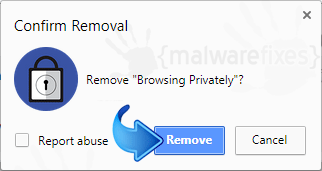 Please click Yes to proceed with the removal of Browsing Privately on the affected browser. 3. On Extensions window, please delete Browsing Privately by clicking on Remove or Trash icon. 4. Google Chrome will prompt for the confirmation of Browsing Privately removal. Please click on Remove button to proceed. Resetting Google Chrome to default settings is helpful in deleting hard-to-remove extension such as from Browsing Privately. This method is highly advisable to perform if you have difficulty in removing unwanted extension. This function will reset your home page, new tab page, search engine, and other areas affected by Browsing Privately. Unwanted extensions will also be removed from the browser. This will not affect your bookmarks, history, and other saved data. You may also run Chrome Cleanup function from this page. An integrated tool from Google Chrome but with more advanced Adware scanner feature.